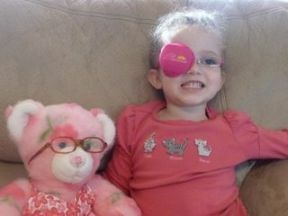 Belle, 4 years old – wears glasses and a patch for amblyopia. She is in Disney Princess Snow White 2 frames and a coordinating “Princess” patch from Patch Pals. Her bear & glasses are from BuildABear. Best thing I did to get her excited about her glasses!!! !